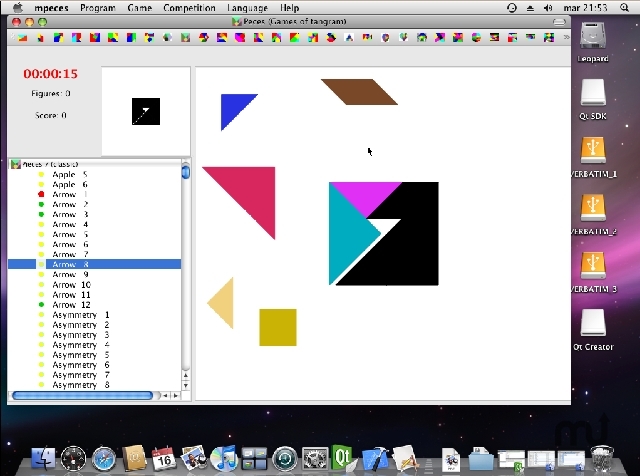 Open source version of the Chinese game Tangram. Is there a better alternative to MPeces? Is MPeces really the best app in Puzzle category? Will MPeces work good on macOS 10.13.4? MPeces is an open source game based on the Chinese game called Tangram. The main objective of the game is to create different figures by putting together pieces like squares, triangles, rectangles, and others. This simple yet challenging game has at least 39 gaming modes and 4 different difficulty levels. You will be able to select among different figures like trees, boats, animals, etc., and at the precise moment you start to move the pieces a timer will start counting the time that you will spend trying to solve the challenge. The game has four difficulty levels, which makes it suitable for both, kids and adults. MPeces needs a review. Be the first to review this app and get the discussion started! MPeces needs a rating. Be the first to rate this app and get the discussion started! The game has four difficulty levels, which makes it suitable for both, kids and adults. Besides, the game incorporates 39 gaming modes (and more 18,000 shapes), from 3 to 16 pieces, and this feature makes the game a real challenge. Another good feature of the game is the possibility to create new figures and add them to the main game. In addition, it is possible to create competitions against your friends, and select only the shapes you want to use. Moreover, you will be able to save these shapes to your PC, in order to use them later.